ANAHEIM, Calif. (AP) — Mike Trout tracked Christian Yelich’s high fly to the warning track and leaped to make a picture-perfect catch above the wall. Yelich could only respond by smiling and doffing his helmet in Trout’s direction. On the rare occasions when Trout doesn’t hit a homer these days, he’s taking big hits away from his fellow MVPs. Trout made up for his first homerless game since last Tuesday by coming up with a defensive gem in the fourth inning , and three of his fellow Angels hit their first homers of the season in Los Angeles’ fourth straight victory, 5-2 over the Milwaukee Brewers on Monday night. Trout’s personal-best streak of four consecutive games with a homer ended when he went 0 for 2 with two walks, but the Angels superstar still changed the game with his highlight-reel play on Yelich’s drive. Yelich was robbed of a potential homer for the third time in his career: Pittsburgh’s Starling Marte did it in 2015, and Kansas City’s Jarrod Dyson made an exceptional play on him in 2016. Angel Stadium’s short outfield fences lend themselves to homer-stealing catches, and Yelich likes outfielders having the opportunity to make those plays — even if this one went against him. Tommy La Stella and Justin Bour each hit a two-run homer for the Angels. Andrelton Simmons also went deep and made his own spectacular defensive play on a hard-hit grounder by Lorenzo Cain to kill a rally in the second. Trevor Cahill (1-1) pitched six strong innings of five-hit ball in his home debut for the Angels, who have rebounded from a 1-6 start to the season. Trout walked and scored in the eighth on the first homer this season by Bour, who was off to a 3-for-31 start with his new team before his clutch two-run shot. 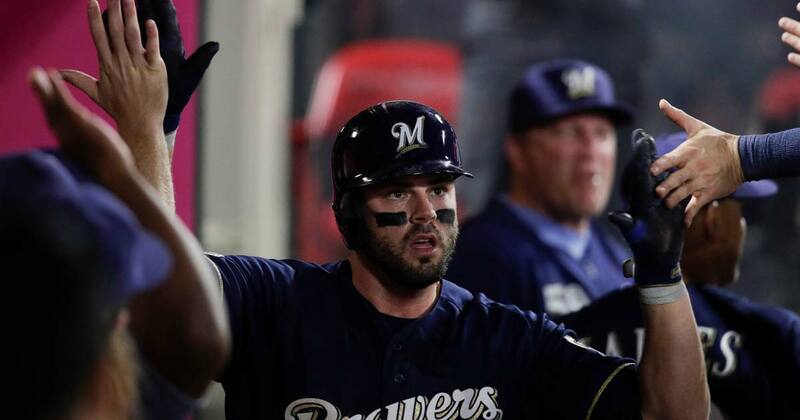 Mike Moustakas hit his 150th career homer in the Brewers’ first game at Angel Stadium since June 16, 2010. 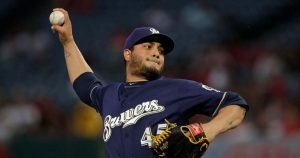 Jhoulys Chacin (2-1) pitched three-hit ball into the seventh, but Milwaukee opened its six-game road trip to the Los Angeles area with its second loss in three games after a 7-1 start to the season. Cody Allen pitched the ninth for his second save out of the Angels’ stellar bullpen, which has yielded a major league-low six earned runs in 38 1/3 innings. La Stella’s homer in the second was his first for his new team. The utility infielder and pinch-hitting specialist homered once last season in 123 games with the Cubs. Moustakas ended his 0-for-19 slump in the second inning with a one-bounce drive off the right field wall, although the San Fernando Valley native was held to a single because he fell down on his way to second and had to retreat. Moustakas made his journey around the bases much safer in the fourth with a no-doubt homer over Trout’s head. Brewers: Josh Hader understandably wasn’t available after he recorded an eight-out save against the Cubs on Sunday. Angels: 3B Zack Cozart was held out of the lineup after getting hit by a pitch on his left forearm Sunday, but he entered to play defense in the eighth. Los Angeles recalled converted catcher Taylor Ward as a backup infielder. … Shohei Ohtani is still taking batting practice, but hasn’t faced live pitching in his comeback from Tommy John surgery. He is on schedule to return in May. Matt Harvey (0-1, 9.00 ERA) attempts to bounce back from a dismal home debut with the Angels in the middle game of the series. The Brewers counter with Freddy Peralta (1-0, 3.27), who is coming off a gem with 11 strikeouts over eight shutout innings against Cincinnati.